← You call them LEFTOVERS, I call them RECIPE SHORTCUTS. I have been seeing like a million people mention Pomegranate Molasses over the last year. Bon Appetit has a recipe, Anne Burrell has a recipe, seriously – I keep seeing it referenced everywhere. So last week, after the kids had their Tae Kwon Do lesson, I happened to wander into the little market next door – I’m a SUCKER for grocery stores. Seriously, I think I must be the only person on the planet that finds them so fascinating. Like little windows into the cultural makeup of a neighborhood, a culture specific to that block and people. So many cool bottles and jars, strange and wonderful labels in a myriad of languages. I take joy and comfort wandering up and down grocery aisles. So I wandered into this little market and picked up a brick of Syrian cheese, some random Georgian walnut/grape dessert thingie, and a small bottle of Pomegranate Mollasses! WooHoo! RANDOM NOTE: Do you know what grenadine is? Boiled and strained Pomegranate seeds which are added to a simple syrup and reduced. I’ve been making my own for a few months now (whenever I find a bag of pomegranates on sale) and it’s AMAZING. I’ll post about it another day. So back to the molasses. I’ve been holding onto this stuff, hunting for a recipe I just had to try – and today, I found it. 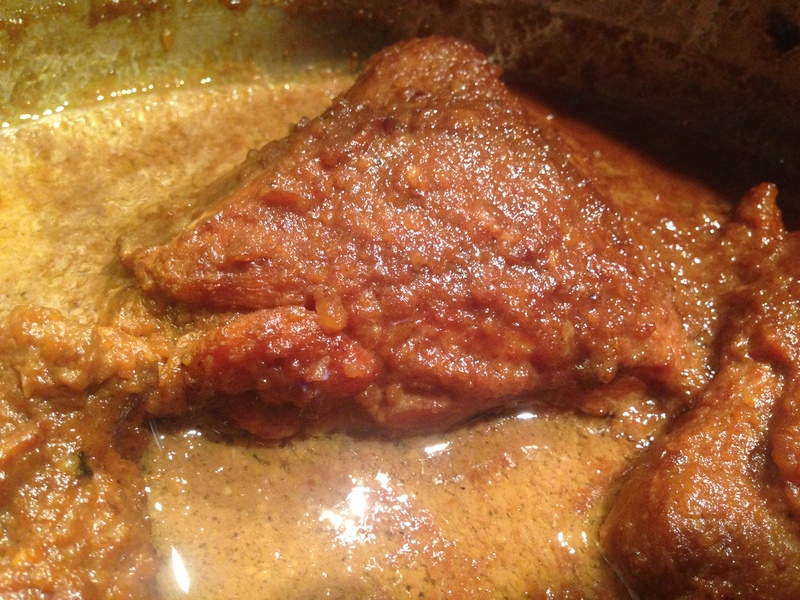 Fesenjan Persian Chicken Stew with Walnut and Pomegranate Sauce. Even the name makes me swoon a little bit. Turns out, it’s a pretty easy recipe if you have all the bits and pieces on hand – I even made SURE I had everything ahead of time. NO SUBSTITUTIONS – well, aside from swapping out the butter for some non-dairy margarine. That doesn’t even register as a substitution anymore. So you de-skin some chicken thighs, pat them dry, then brown them in a little butter/margarine and oil, take them out and throw in a chopped onion. When they’ve softened, you throw the chicken back in and add in some stock. Cover and cook for 30 lovely minutes. Meanwhile you toast walnuts and then let them cool. Then you grind them in the food processor. You throw in some sugar, cinnamon, turmeric, nutmeg, salt and pepper. After the 30 minutes are up, you dump in the nut-sugar-spices mix and a bunch of pomegranate molasses, stir and then cover it all up again for an hour. Oh, you have to stir it every 20 minutes or so, to make sure the nuts don’t stick to the pot. I asked C what he wanted to eat with this – rice or pasta. I’m not sure why, but I talked with mybestfriendGoogle about the best way to make rice in the rice cooker – did you know there are a GAZILLION other things you can make in a rice cooker besides rice?? Wowsa. Interesting fact #2 – rice in the United States is required by law to be coated with all kinds of vitamins? When you rinse rice you’re actually washing off the vitamins. Huh. I never knew that. So tonight I picked through the rice, but didn’t rinse it. So I dumped the rice into the rice cooker and instead of using water & a bouillon cube (as is my norm), I subbed in Almond Milk to see if it’d be any/much different. I usually take a mug of water/stock/almond milk and a b.cube and heat them up in the micrslave for a minute to allow the b.cube to dissolve. Then I pour it over the rice and add more water/stock to cover the rice by about an inch. I like the way the bouillon flavors the rice. The almond milk added a touch of creaminess without it getting goopy. I liked it! 2 lbs boneless skinless Chicken thighs and/or breasts, trimmed of excess fat, cut into medium size pieces, patted dry and salted **I didn’t salt as I used Kosher chicken. OH CRAP – I also left it completely whole. I didn’t cut it into pieces. Whoops. 1- First toast the walnuts. You can do that one of two ways. You can either spread them out in a single layer in a large skillet, and toast them on medium high heat, stirring frequently until lightly toasted, or you can spread them out in a single layer in a baking rimmed baking sheet, and toast at 350°F in the oven for 8 to 10 minutes. In either case, once toasted, remove from heat and allow to cool. Once cool enough to handle, pulse in a food processor or blender until finely ground. 2- In a large pan, heat 1 tablespoon of butter/margarine and 2 tablespoon of olive oil over medium-high heat. When the butter has melted, pat the chicken pieces dry again and place the chicken pieces in the pan, working in batches if necessary to not crowd the pan, and cook until golden brown on all sides. Sprinkle the chicken with salt while they are cooking. 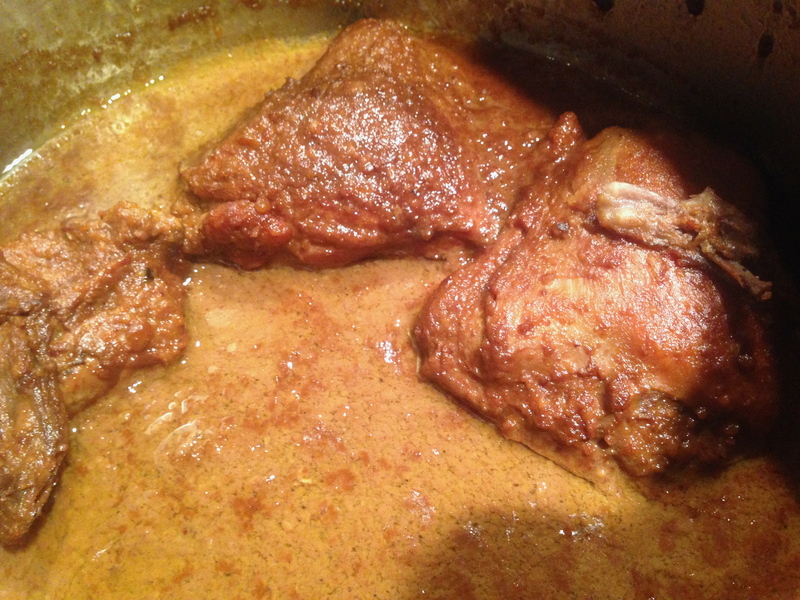 3- Use a slotted spoon or tongs to remove the chicken from the pan, set aside. Add a tablespoon of butter/margarine and a tablespoon of oil to the pan. Lower the heat to medium low. Add chopped onions to the pan and sauté until translucent, stirring on occasion to release the browned bits from the bottom of the pan. 4- Return the chicken pieces to the pan with the onions. Pour 2 cups of chicken stock over the chicken and onions. Bring to a boil, reduce to a simmer, cover and simmer gently for 30 minutes. 5- Stir in the ground walnuts, pomegranate molasses, sugar, and spices. Cover and cook on very low heat for 1 hour, stirring every 20 minutes or so to prevent the walnuts from sticking to the bottom of the pan. 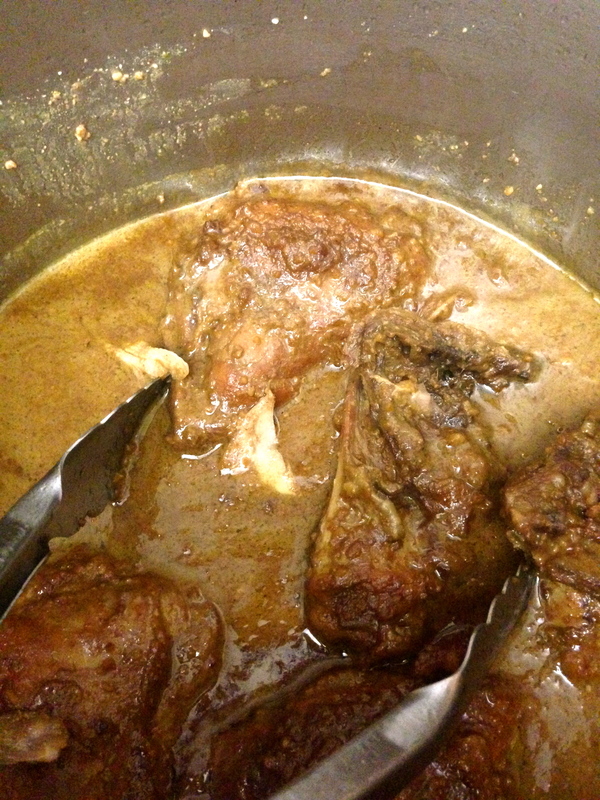 6- Remove from heat and adjust sugar/salt to taste. At this point the chicken should be fall apart tender. Garnish with pomegranate seeds. Serve over parsi pulao or other favorite rice. **Ha. I forgot to ‘garnish’. END RESULT: C and I both had seconds, with extra sauce! The twins were…finicky tonight. R insisted that she only wanted to eat her chicken ON the bone (after I’d already cut it off – smh) and J decided that his entire dinner should consist of apple juice. 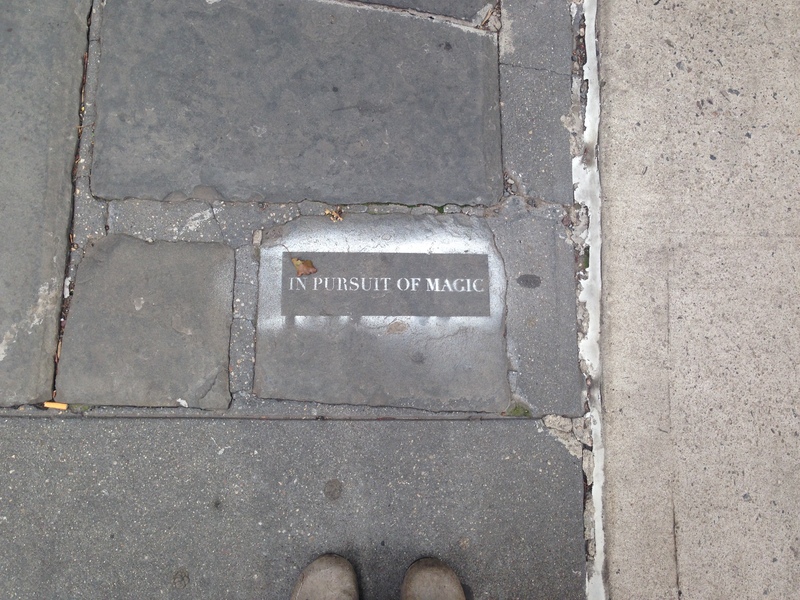 On the streets of NYC – somewhere in the West Village. Yummmmmm! I want to come out and enjoy some of your home cookin’!